(Bloomberg) -- Deutsche Bank AG’s DWS Group soared the most ever in Frankfurt trading on news that Allianz SE is exploring the possibility of combining it with its asset management arm to create a national champion in active money management. The Munich-based insurer is looking at the feasibility of a deal with Germany’s largest lender to create a business with 1.17 trillion euros ($1.33 trillion) under management, people with knowledge of the matter said, asking not to be identified in discussing internal matters. 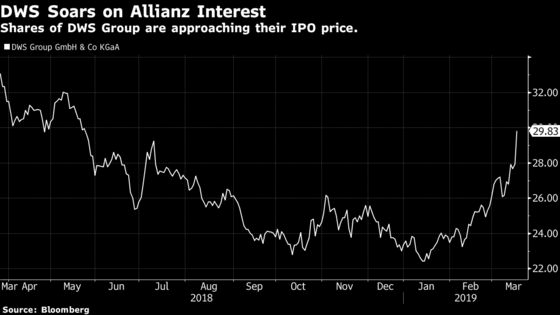 Allianz’s deliberations are at an early stage and may not lead to any formal talks or agreement, the people said. DWS soared as much as 14 percent in Frankfurt and was trading 6.6 percent higher at 29.79 euros as of 3:15 p.m. The stock is up 27 percent this year. DWS is one of Deutsche Bank’s crown jewels and the lender is reluctant to sell its holding, one of the people said. Still, such a transaction could help the bank finance a merger with Commerzbank AG. The lender may have to come up with about 8 billion euros for restructuring expenses and revaluation of certain assets should it decide to combine with its cross-town rival, according to Christian Koch, a DZ Bank analyst. DWS has a market capitalization of 6.1 billion euros, valuing Deutsche Bank’s 78 percent stake at about 4.8 billion euros. Deutsche Bank may need to fetch at least 32 euros per share to avoid a writedown on the value booked on the lender’s balance sheet, according to people familiar with the matter. For asset managers seeking scale -- and there are a lot these days -- a sale of DWS would present a rare opportunity for a large deal. The firm has one of Europe’s biggest offerings of exchange traded funds, as well as a sizable real estate business.